Not so long ago, thanks to the University of Nottingham’s Landscape, Space and Place reading group, I encountered an article by prehistoric archaeologist Tony Brown published in the Journal of Wetland Archaeology (those with access to Maney Online can read it here). It’s a punchy blast through the broad and very interesting field of the definition of sacred spaces and places and the archaeological indices thereof, one that is increasingly current in early medieval archaeology as I have alluded to in a number of previous posts and pages. Brown’s treatment of the medieval manifestations of the use of river islands as sacred places is fairly fleeting, but it did cause me to get thinking again about something I had been unable to resolve before – why the gravel island on which Newark Priory was built (and where its ruins still stand, as evidenced by this awesome aerial photo on the, er, Surrey Property website) was once known as Aldebury. Seemingly an Old English name meaning “old stronghold” (here and for the rest of this piece I use the headline translation given in the benchmark but at times blinkered account of the term burh given by Parsons & Styles 2000, 74-85), so far as I know it has never been the subject of detailed examination with a view to finding out its origin. By a pleasing twist of fate, the book I had on the go at the time was John Baker and Stuart Brookes’ Beyond the Burghal Hidage: Anglo-Saxon Civil Defence in the Viking Age, the primary outcome of the Leverhulme Trust-funded project of the same name. Now if there are two things which it’s fair to say characterise at least the opening passages of the things I write for Surrey Medieval, they are (1) excellent new books stimulating new ideas and directions for my research and (2) the prohibitive cost and/or seeming wilful obscurity of the products of important research projects. This book is the very definition of both. Right now – and time may be kind to those at the publisher responsible for setting the price – the book is not available to buy for less than £129, which I hope you’ll agree is a completely ridiculous price for anyone outside of an institution or with money to burn. Good as the book is (and overall it is very good), it’s not worth dropping that amount of cash on. Best hope there’s a paperback edition on its way (or e-book, though versions of academic titles rarely seem to be especially great value for money). Anyway, like I say, the book is good and it has prompted me to view some things in a different light. Initially in my University of Nottingham library copy and later in my photocopied-for-a-fraction-of-the-price unbound A4 paper “edition”, I noted with interest a series of discussions of places along the Thames which could be argued to have some bearing upon proffering an interpretation of the name Aldebury. 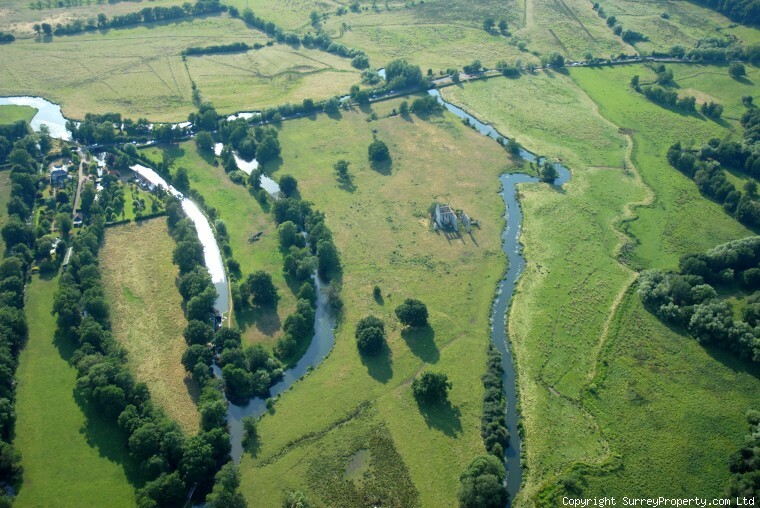 First up is an appraisal of the long-recognised close pairing of Cookham, site of a monastery of great value and political importance towards the end of the eighth century, and Sashes, the Burghal Hidage-listed stronghold of Sceaftesege whose identified mid-floodplain island situation matches not just the islands discussed by Brown, but perhaps more relevantly that of Aldebury/Newark (Baker & Brookes 2013, 296, 306-309). A little further downstream, the book offers an excellent new reading of some of the evidence for Anglo-Saxon Staines, with the proposition that it may have been a pre-Viking Age Mercian stronghold (Baker & Brookes 2013, 303). The place-name Binbury, attached to the gravel island on which stands the parish church (successor in status if not in site to a late-documented minster) is suggested to perhaps derive from the Old English elliptical compound binnan-byrig, “within the stronghold” (Baker & Brookes 2013, 299 footnote 38). One important piece of evidence cited in support of the Mercian interpretation of Staines’ politico-military significance in this period is the excavated and partly radiocarbon-dated execution cemetery at London Road, the earliest inhumations from which belong to cal AD 670-900 (Baker & Brookes 2013, 300), thereby complementing the historical testimony for Mercian control of the region in the period circa 725-825. It’s a touch strange, therefore, that the name Budbury Hill, attributed to the gravel island on the south side of the modern town centre, was excluded from the analysis despite being noted in the published report of the execution cemetery (see Hayman & Reynolds 2005, 216 Illus. 1). In light of its attachment to an area of raised ground, possibly it represents a distorted form of Old English be(o)rg and so is linguistically irrelevant to the matter. The third and final interesting suggestion I came across concerns Kingston upon Thames, and the revisiting of a suggestion made by Rob Poulton that it may have fulfilled a role as a mid-Anglo-Saxon stronghold (Poulton 1987, 211; Baker & Brookes 2013, 303-304). It’s worth noting in this regard how Mid to Late Anglo-Saxon activity was focused on the so-called Central Kingston Island, formed by the intersecting channels of the Latchmere Stream, Hogsmill River and the Thames (Andrews 2004, 172 Fig. 13.2). There’s something of a tendency to try and load as much significance and as many functions on to Kingston as possible and, while in some respects it was clearly an important place from the middle third of the ninth century, I can’t help but feel the fact its archaeology is so at odds with such approaches should be telling us something about what and where things were going on – or not going on as the case may be. Sidestepping further discussion of Kingston (a subject which I aim to return to on another occasion), the manner of its inclusion in Beyond the Burghal Hidage suggested to me that there are real grounds for seeking Mid-Anglo-Saxon stronghold sites outside of those recorded in the Burghal Hidage text and the well-known annals which add others to their number. Of the three places cited above, it is Staines which stirs the imagination the most – not something I imagine is said all that often! Another strand of evidence not considered in the published discussion is the discovery of several Anglo-Saxon coins ‘on an excavation on the north bank of the Thames near Staines’ in 1988 and 1990 (BNJ 1988, 148), carried out by the Windsor Archaeological Group, about which the internet tells me diddly squat. Four of the coins are Mercian pennies: two of Offa (EMC 1988.0143, 1988.0146), two of Coenwulf (EMC 1988.01531, 1990.0195). Marion Archibald called this site ‘exceptional’ for having a greater number of broad pennies to earlier eighth-century proto-pennies (BNJ 1990, 160). The veil of secrecy around their provenance at the times these coins were first brought to public notice has not been lifted because the promised excavation report was never published; my presumption that it was at Staines itself is founded upon Alan Vince’s passing mention of ‘Excavations at Staines… have shown… that there was a centre near Staines, at Binbury, in the mid-Saxon period’ (1990, 136). If the connection is correct, then the coins collectively comprise an index of Staines/Binbury’s importance in the period of Mercian supremacy much like the London Road execution cemetery. To me, all of this had (and still has) deafening echoes of my proposal last year of a series of sites across mid-Surrey – Dorking, Leatherhead, Shalford and/or Guildford – identified by concentrations of broad-flan pennies which I took to be the sites of modest minster churches and associated estates appropriated by the Mercian crown as a means of reinforcing control of the Surrey interior and to regulate trade, taxation and other “official” coin-based transactional activity. There’s something of a dissociation between the numismatic data (and circumstantial evidence of adjacent churches of minster status) and the documentary testimony for royal annexation. These tend to survive for larger monastic foundations. Chertsey is one such monastery (S 127 being the basis for the contention) and Woking is another, with a genuine-looking diploma in the name of Offa granting (back) the monastery 20 hides of land (S 144). In neither case are any contemporary coins (or other artefacts) known from their environs. Later Old English charter-bounds identify a burh-ēg, “stronghold island”, in the vicinity of Chertsey (burgh ege in S 1165 and burgh eyge in S 353, remembered by and thus in the vicinity of Laleham Burway; Baker & Brookes 2013, 309, report equivalent minor place-names near to Sonning and Bampton, also minster sites). This raises expectations for the antiquity of the name Aldebury, attached to an island site before the year 1200, yet it does not shed much light on what caused its coinage. Could we be looking at a pre-Viking stronghold and/or refuge separate to the minster site? By implication, this would be earlier than the burghal centres upstream on the Wey at Eashing and Guildford. Or might this belong to a later minor fortification, perhaps dating from the crises of the tenth or early eleventh centuries? Alternatively, is an Anglo-Saxon military explanation wrong and that the name stems from recognition/characterisation of Romano-British or earlier activity on the island? One means of broaching these questions is by looking at places with names of the same formation and basic meaning in Surrey. The Newark Aldebury‘s namesakes are a mixed bag, although none of them can be said to occupy an island site. Two are identifiable as Iron Age hillforts: St Ann’s Hill (Eldebury 1321: PNS, 111; cf. Baker & Brookes 2013, 299) and St George’s Hill (Oldebury 1548, earlier le Bery 1337: PNS, 97). The earthwork on Chobham Common known as The Bee Garden is believed to be the inspiration for the nearby place-name Albury Bottom; it has been tentatively interpreted as a prehistoric or Roman-era enclosure partly-remodelled in the medieval period to put (or return) it to use for stock management (PNS, 118; Ellis & English 2008). A name likely to be of wholly medieval origin is Albury Manor at Merstham, attached to a moated site first named as such in 1327 (Aldebury: PNS, 301 – its history has been subject to a fun-sounding community archaeology project). Something similar may be posited for Old Bury Meadow in Headley given its earliest attestation (La Eldeburi 1313: PNS, 378) occurs in an Inquisition Post Mortem, a type of document usually associated with the manor-holding classes. The three crofts known as Aldberyes 1509 in Oxted on the other hand most probably stem from the locative byname of a former owner whose family came from another place so-named in Surrey or elsewhere (Leveson-Gower 1874, 138-39). As for Old Burry in Banstead (Eldebury 1364 and 1416), its brief mention in the field-names section of The Place-Names of Surrey (page 377) gives no indication of what lay behind the name, and a glance at the modern OS map is no help either. Last by but no means least comes Albury between Chilworth and Shere (Eldeberie in Domesday Book: PNS, 219). It is the only Surrey name of this formation to become that of a parish. 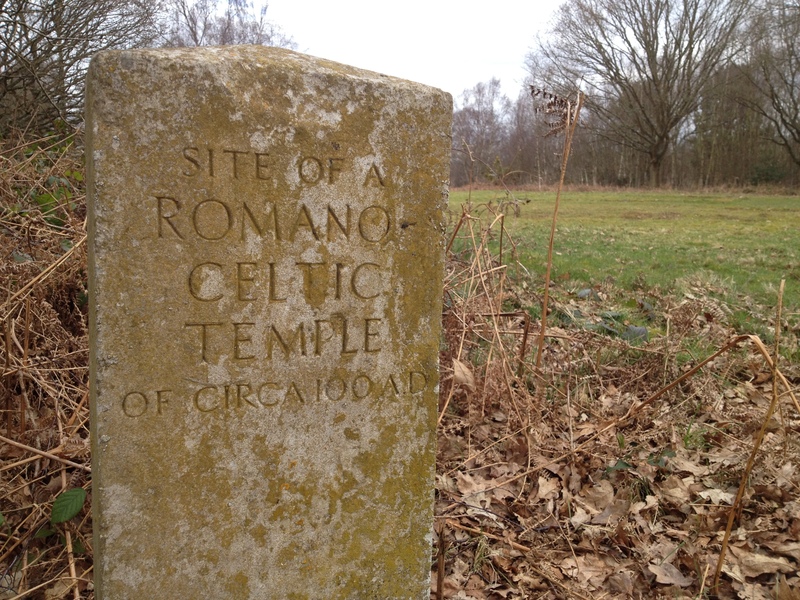 Traditionally, it has been understood to derive from the Farley Heath Romano-Celtic temple in the southern portion of the historic parish (e.g. PNS, 220). It is true that the temple was surrounded by a highly-unusual polygonal temenos, while the remnants of a later sub-square earthwork enclosure can still be perceived around the temple foundations (Bird 2008, 68, who calls the latter ‘part of a wider medieval or later complex’). There is no known place-name in Surrey from Old English cæster, as was often attributed to Roman-era remains, and the morphology of the Farley Heath site strictly speaking is apt for the use of burh. All the same, for a few years now I have felt that something about the explanation doesn’t quite stack up. Turning our thoughts back to Aldebury, in acknowledgment of the probability that the name is of pre-1066 origin, should we look again at bury-type names in the vicinities of the places listed above as being Mercian-annexed minsters for signs of similar politico-military developments and attendant naming practices? One might postulate the name Bury Hill between Dorking and Westcott (Burihulle 1366: PNS 274-75) is descended from an elevated stronghold overlooking or at least associated with the proximate “productive place” at Milton (a place-name with interesting implications of its own). On the other hand, personal research in Puttenham and surrounding parishes has taught me Middle English bury was extensively used in the later medieval period to identify land in demesne. Thus, without proof to the contrary arising from careful historical and archaeological research (or when there are no extant earthworks), such names – so often late to occur on record – should perhaps be understood in later medieval manorial terms. The circumstances of Aldebury do not fit readily with any of the above-mentioned namesakes and instead it gives some grounds for association with the disparate group of “burh islands” described above. As a result, more individual explanations should be sought for what it was about – or rather, on – the Newark Priory island which guided the formation of its earliest recorded name. John Baker offers a brief discussion of the Aldebury > Newark (literally “new work”) name-change, noting that names in Old English (ge)weorc or its Middle English equivalent werk (?) ‘often belong to buildings with an ecclesiastical association’ (Baker 2012, 325; he also highlights Newark’s alternative appellation as Novo Loco, “new place”, although wrongly asserts the 1220 occurrence noted in PNS, 148, was the ‘single use’ of the Latin form). Because of its emphasis on (ge)weorc rather than burh, this can act as no more than a foundation for evaluating Aldebury, given Newark is a name inextricable from the Augustinian priory which bore it. The name Newark may be an oblique reference to that of its chosen site, but other interpretations are possible. As this note reaches its natural end-point, now is the time to reveal that since first drafting it I have made some major revisions to my thinking on Woking/Send/Pyrford in the early medieval period. I am in the process of setting these thoughts down on paper, and in time expect to see them appear in more polished form somewhere around here. Suffice to say the name Aldebury and its island site are of pivotal importance to this new line of interpretation, fitting neatly within a wider framework underpinned by history, topography and (by virtue of near-absence) archaeology. It retains it as an Old English formation, only suggests it may be significant in aspects not discussed here. Indeed, there are strong reasons for considering Aldebury to denote a very important place.